This morning we boarded our time machine again, to visit yet another epoch. On Saturday we visited 1-50 AD at Herod’s castle, and then leaped forward 1,100 years to arrive at Karak castle. On Sunday we zipped back to 400 BC to survey the Nabatean civilization at Petra. We really cranked up the time machine this morning, traveling back over 11,000 years to visit the oldest known collective dwelling site on the face of the earth, at Bada in southern Jordan. Jericho is generally regarded as the oldest city on Earth, and Damascus is seen as the world’s oldest continuously inhabited city. The ruins at Bada, which we visited this morning, pre-date Jericho by more than 5,000 years. Bada was not a city in the strict sense of the term, since it had no wall encircling it, and no defined territorial boundaries. The ruins at Bada definitely reflect a collective dwelling site, however, and is our earliest indicator of man’s transition from a mobile, hunting-oriented species to an agrarian, settled society. And not fifteen feet from the ruins of this 11,000 year old collection of dwellings is a large Bedouin tent. Children play around the tent, and try to sell us trinkets and stones from the area. A woman inside the tent brews tea. Life for these Bedouins, as we observe them at this prehistoric site, has probably not changed significantly for almost 3,000 years. Ancient history living side by side with pre-history, in defiance of everything we believe about “progress” in the West. 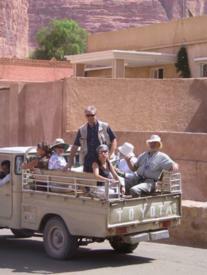 From Bada we again join the King’s Highway for the journey to Wadi Rum and Aqaba. On the road we observe an endless procession of heavy trucks heading north out of Aqaba. Our guide tells us that, during the 1980’s, when Jordan had very close ties with Iraq, the Iraqi government financed and helped to construct major portions of the King’s Highway in the south of Jordan. Since Iraq lacks access to the sea, the overland route from Aqaba to Baghdad is the quickest way to move supplies from the Gulf to the Iraqi capital. Recognizing that the Romans also helped in the construction of the King’s Highway over 2,000 years ago, and understanding that a major motivating force for that ancient project was the rapid movement of the Roman legions, one might speculate that Iraq may have had more than commerce in mind in financing this modern version of the same project. Other wars have been fought to obtain access to the sea. Iraq’s invasion of Kuwait in 1991 had that as one of its objectives. The politics of this region are a conundrum. Wadi Rum is the desert landscape made famous by Colonel T.E Lawrence, better known as Lawrence of Arabia (Lawrence of Jordan just doesn’t have the same cachet, besides which Jordan didn’t exist as a political entity at the time). We board 4-wheel drive vehicles at the Visitors Center (Toyota trucks with bench seating for three along each side of the truck). Sailing through the desert, we observe mountains of sandstone and granite rising precipitously from the flat ocean of sand all around us. Some of the peaks top 5,000 feet. Inexplicably, a tree appears here and there in the vast expanse of sand, surviving against all odds in this unrelenting dry heat. And so, too, do the Bedouins. Again we encounter this tribe of nomadic people, although in this locale they have created a small village of conventional dwellings, which they inhabit intermittently. Roaring over a small rise in the sand, we come upon a goat hair tent, not twenty yards from the track (calling it a road is way too generous) we follow. Arriving at our destination in the desert, a small ravine in one of the mountains that hold ancient rock carvings, we encounter a Bedouin at the entrance to the ravine, selling carved camels and other trinkets. The Bedouin knack for commerce rivals that of their Nabatean brothers. Brushing off the sand, we board our motor coach for the ride to Aqaba, a drive of about 45 minutes from Wadi Rum. Culture shock awaits us, as we arrive in a modern city with major thoroughfares, way too much traffic, and fast food restaurants in abundance (McDonald’s, Quiznos). After dinner we take a short stroll to a showing of The Jordan Experience, a multimedia production highlighting all things Jordan (including most of the sites we have visited, which is a great reinforcing experience). Can you name three movies that have been filmed in Jordan? Two of the three are very well known. We end our evening with a visit to the ice cream parlor at the Movenpick Hotel, a Swiss luxury hotel chain about which Drew has been tantalizing us for the past four days. Over ice cream we have a round table discussion (actually three round tables) about our experiences so far, about politics both Jordanian and American, and about everything else that a group of seventeen Westerners who have been traveling together for seven days has on their minds. A great end to the evening, but it ends too soon. Perhaps we will pick up where we left off tomorrow night, in the spa hotel at the Dead Sea.